Early in the process of laying out the route of the railroad, engineers had to determine where to build trestles and where to fill in to keep the track on a steady grade. When they came to the valley carved between Click Ridge and Sensabaugh Ridge, they opted to fill. They built a concrete tunnel over Sensabaugh Hollow Road and Sensabaugh Branch (it runs through the tunnel). 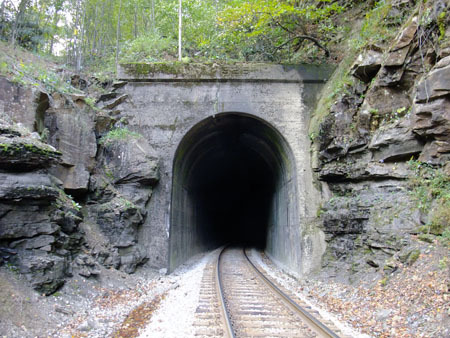 Then, using the rock hewn out of the ridges for Click and Sensabaugh tunnels, they fashioned a 30′ or so high fill to keep the trackage at roughly 1300′ above sea level. 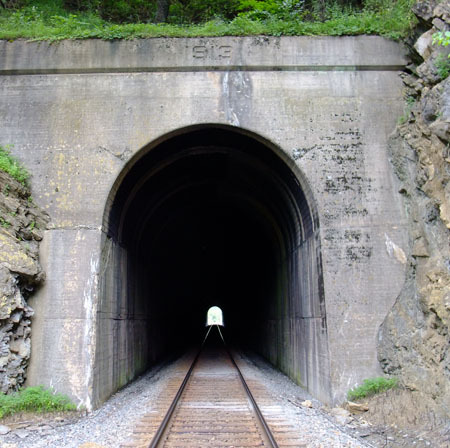 The fill spans the distance from Click tunnel and Sensabaugh tunnel (coming up next). 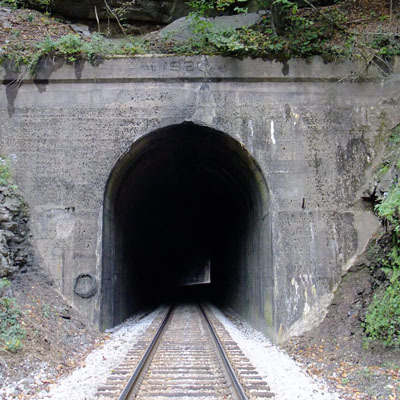 Coming out of Virginia into Hawkins County, you hit Click tunnel at 88.2 miles from Elkhorn City at 36.584876, -82.630481. 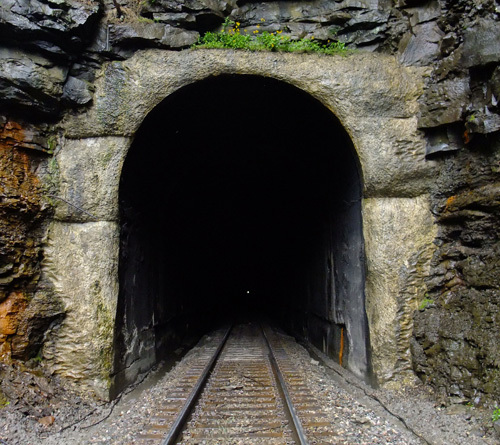 The tunnel is 608′ long and apparently has the original facing set in 1913. 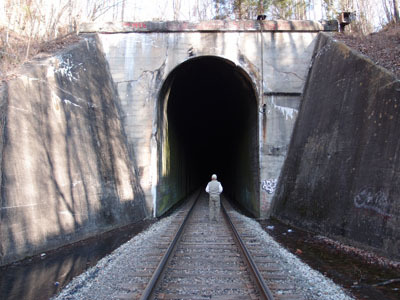 There are stories about the road tunnel below the track being haunted, but, from what I hear, the locals think that’s hooey. 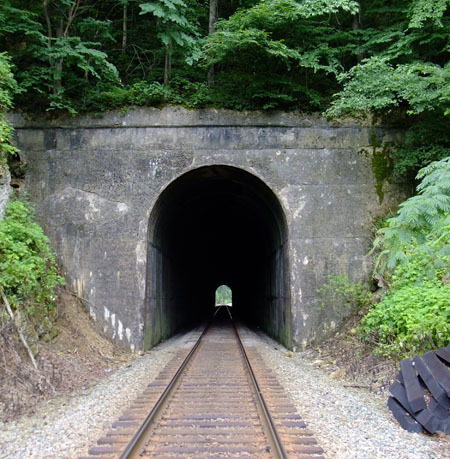 This picture was taken looking northward, with Sensabaugh tunnel to my back. 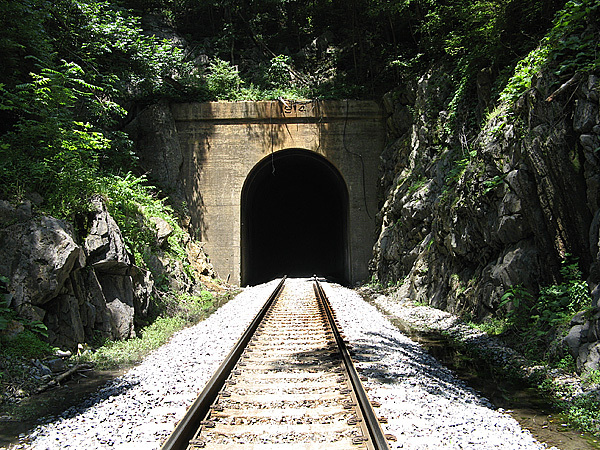 Clinch Mountain tunnel, in Scott County VA, at 36.637520, -82.735412 (center top of tunnel), is 4,135′ long. The date on the lintel is 1909. If you have hawk-keen eyes, you might just be able to see the tiny speck of white near the bottom of the tunnel opening…that’s the other end. It’s unfaced and just across Highway 23 from the Vulcan quarry in Speers Ferry, over a girder plate trestle. The next picture is back on the Kermit side of the tunnel, just off to the right. These are the ruins of a factory that was extant here in the early years of the last century. It mined sand from up on the Clinch Mountain, processed it, and shipped it Pittsburgh Glass. 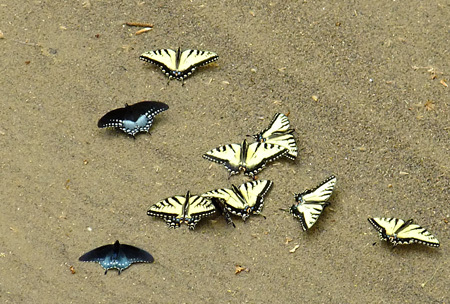 Odd to find that here…maybe it was super duper sand, or something. Remnants of the rail siding are still visible (not in the picture)(sidings aren’t particularly interesting). As of October, 2013, the ruins of the factory are still much the same, but heavily overgrown. And, just as the last time, as I was taking this picture series (I’m just posting one), a CSX mixed-unit train came rolling through, generating enough wind in the cut to nearly take my cap off. 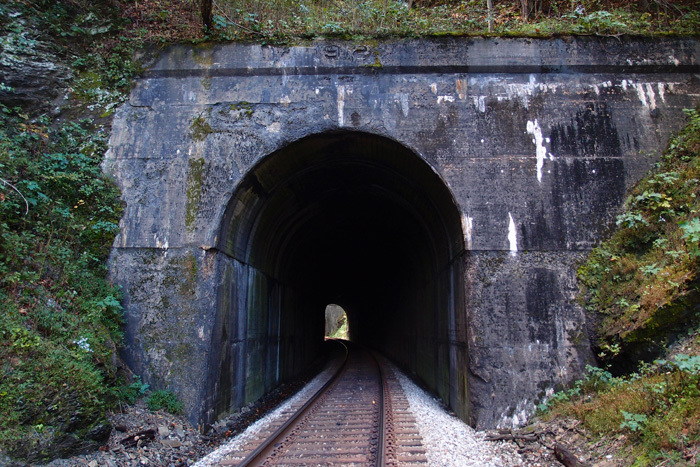 This tunnel is just west of Gate City VA at 36,647391, -82.744457. 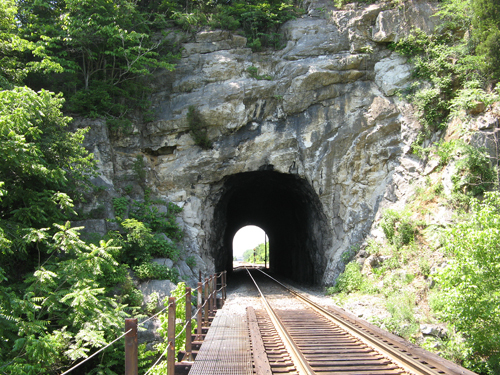 It’s 1,116′ feet long and has an odd-looking south portal, kind of skewed. Just back toward the highway from the tunnel is a quarry that you shouldn’t mess with, but is really an interesting place. I’d tell you we walked all through the quarry, which is quite large and rather moonscapey (if you had a moonscape complete with a deep blue lake off to one side) and got some interesting pictures (which I’ll be posting on my other blog unclebobstravels at some time), but I can’t, since that would have been trespassing and such. 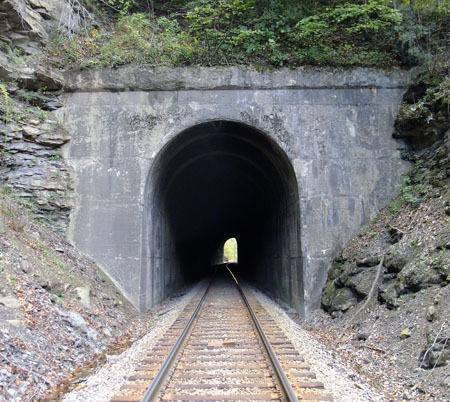 With this tunnel, we’re nearing the Tennessee line. 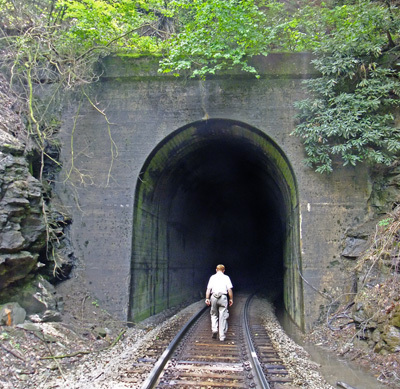 Up next, the 4,135′ Clinch Mountain tunnel, with an associated surprise. 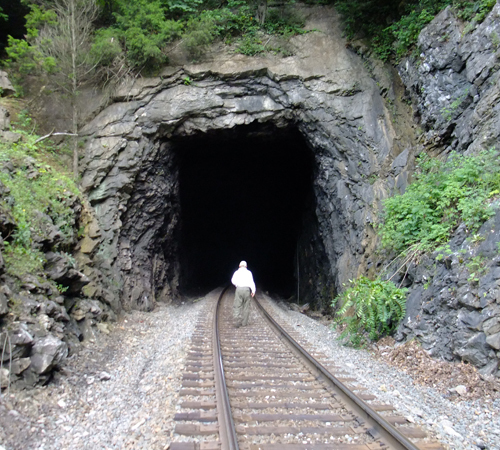 We’re a little more than 77.5 miles south of Elkhorn City at Clinchport tunnel, actually near Boulder VA. The railroad here crosses SR 644 on a 1929 overpass (shown). 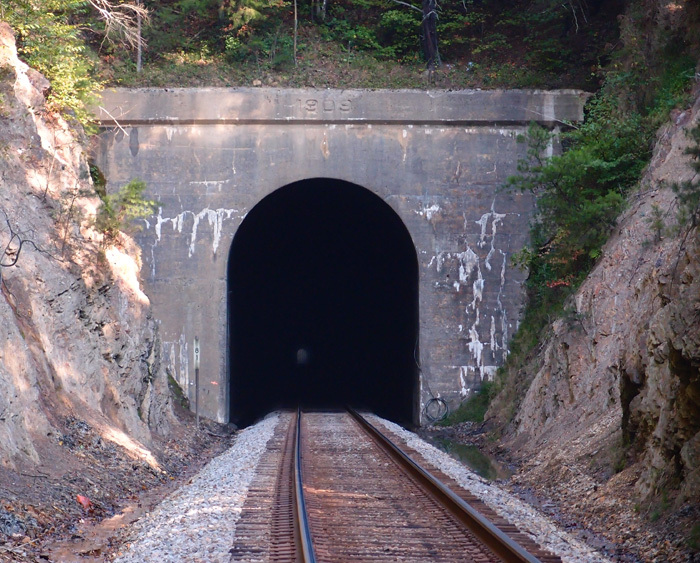 Tunnel is at 36.671713, -82.745216 and is 637′ long. The first picture is looking south and the second picture is looking north with the lintel of the tunnel clearly showing the 1913 date. 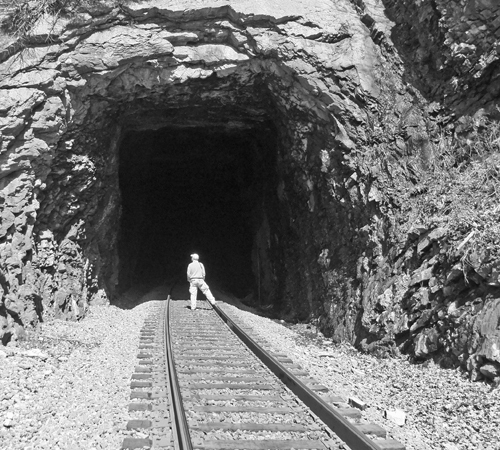 This was two years before the Clinchfield Railroad was officially completed. 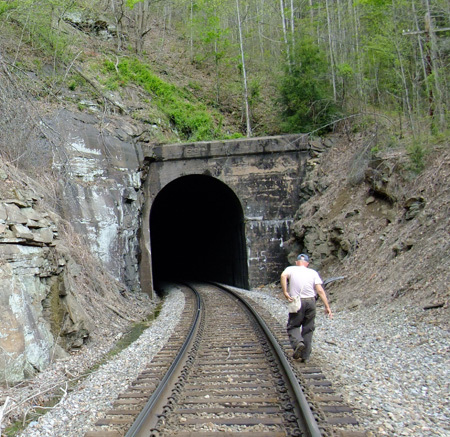 Located in Scott County VA, where the Clinch River makes a wide bend, these two tunnels bypass it by cutting through two close ridges. The North Twin (308′) is 71.26 miles south of Elkhorn City (quickly vanishing in the distance, well over the horizon, lost in Kentucky). The South Twin is just a few feet beyond the North. If you were standing between them, you’d be at 36.709679, -82.646909 and an elevation of 1343′. 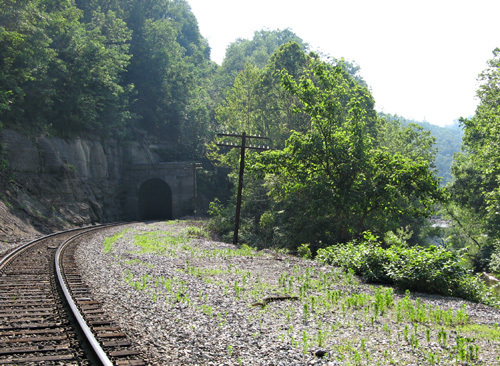 South Twin is just 236′, a mere slip of a tunnel. The first picture is the south portal of South Twin, looking north to the North Twin. 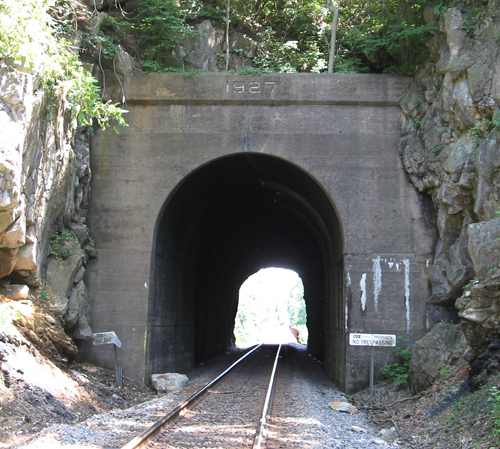 The second picture is the north portal of North Twin, looking south to the north portal of South Twin. They’re both dated 1912. 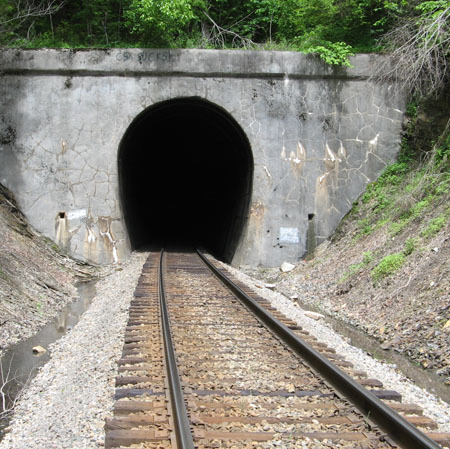 Here we are a little over 70 miles south of Elkhorn City at Starnes tunnel, 517′ portal to portal. This is the south portal, 1911 date, looking north. Again, it’s a horseshoe cross section. 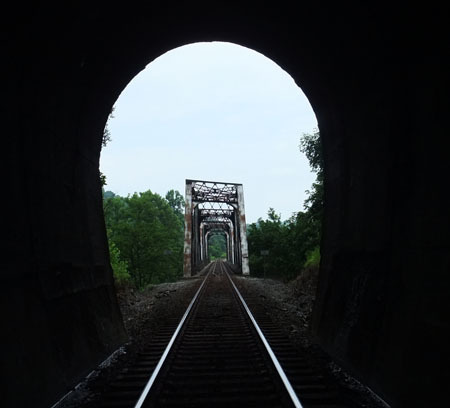 The next picture is from inside the tunnel looking north to what is known as the 3rd Clinch River bridge, a 372′ through rivet truss (according to James Goforth). Calvin Sneed tells that the community near here, Starnes Slant, got the name when the crews were laying the railbed around a curve and kept fighting landslides, so the “slanted” the hillside to provide stability. Hence, Starnes Slant. 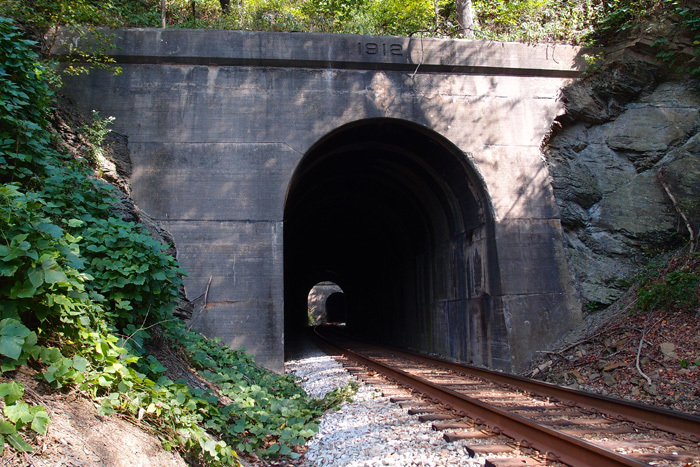 Hold your breath, the Twins are coming up next, then it’s on to Clinchport tunnel. Heading south, we’ve gone from Shannon tunnel in Russell County past the Guest River Gorge, past the old Miller Yard (it was quite a place in its day), to Townes tunnel in Scott County. It’s 1,098′ long. It’s at 36.851101, -82.436563. This view looks northerly, toward Miller Yard. 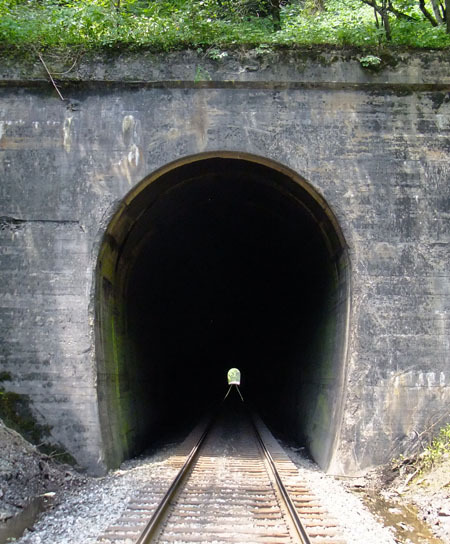 This is an unusual horseshoe shaped tunnel, but the shape is related to the stress lines along the line of the tunnel. 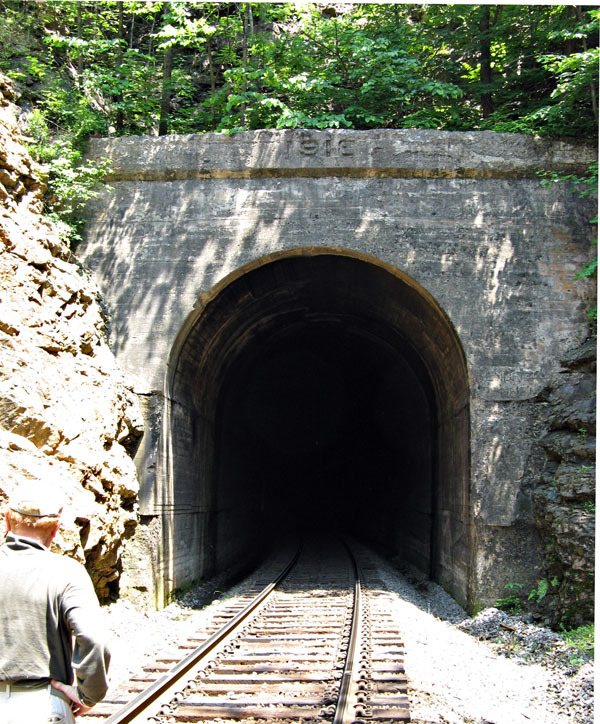 There was a train collision in this tunnel back in the day. It’s said you can still see the scars of the wreck inside the tunnel. I didn’t check, sorry. Starnes is next, then The Twins. We’re now 47.6 miles from Elkhorn City, between St. Paul and Carfax VA in Russell County at 36.890949, -82.354993. 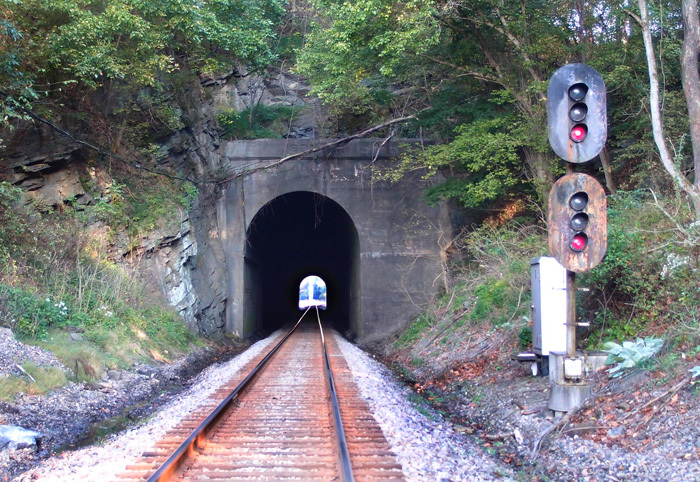 The first picture is the horseshoe-shaped EC side portal of Shannon tunnel, 820′ in length, cutting through a ridge in an oxbow of the Clinch River. The horseshoe cross-section is deliberate, required, research tells me, by ground conditions in the area. 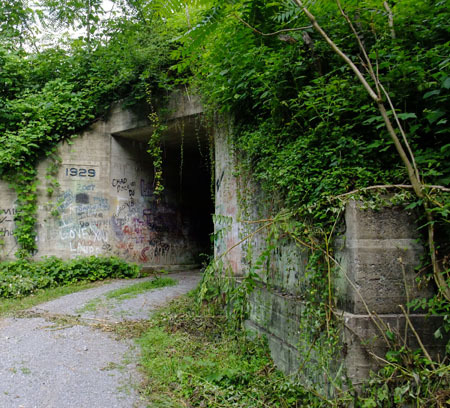 This tunnel is not dated, but there is an impolite reference to CSX spraypainted on the lintel. 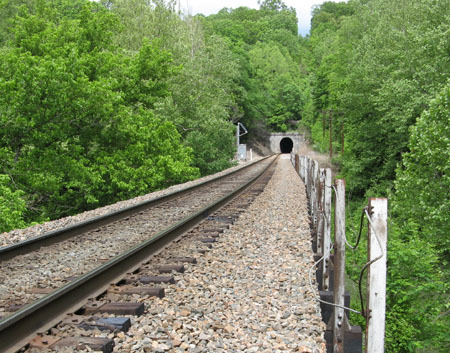 The next picture is of the south (actually west) portal of the tunnel taken from the 300′ or so trestle that takes the CSX over the Clinch River on to Townes tunnel.